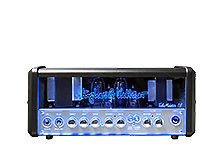 Hughes & Kettner amps have been an essential part of Mr. Fastfinger tone. That tone is based on a holy color trinity. It's Red (my face), Green (the guitar) and Blue (the amp). This RGB trinity can produce any musical color you can think of. Triamp, Switchblade and Tubemeister 18. These amps really inspired me to find my own tone. Been extremily proud and happy playing with these amps. Recently, just when I thought it was safe, they bring in a new amazing amp. I'm now deeply in love with Grandmeister 36. It's beautifully combining all the features I loved with the other amps: the tone, the attack, the control, the versatility and the small size. I'm finding new territories in guitar land once again. Guitar good + Amp good = Life very good. Mika Tyyskä, better known by his stage name Mr.Fastfinger, is a Finnish virtuoso guitarist, and multi instrumentalist who encompasses several genres of music. Originally, Mr. Fastfinger was an imaginary character, created and animated in Flash, to be "host" of the website GuitarShredShow.com, an award-winning combination of further animation and an online guitar school. The online guitar school opened 2005. The website became an international success and Mika Tyyskä was asked to share and to teach in clinics and guitar camps in Europe and Japan. He teamed up with companies like Hughes & Kettner, TC Electronic and Moder Music School. Charismatic cartoon character had turned out to be much more than Mika had originally visioned. Mika's lifelong dream came true when Mr. Fastfinger's first solo album, The Way Of The Exploding Guitar, was released in 2009. Album featured some of Mika's musical heroes, Jordan Rudess, Mattias IA Eklundh and Christophe Godin. Soon a live band was put together. Live show's combined live playing with cartoon animations running on the screen. Mr. Fastfinger's second album In Motion was released in 2013. The release of the second album lead Mika to produce content to various instructional websites, most notably Jam Track Central, Rockway and BendNote. In 2013 Mr. Fastfinger had an opportunity to jump back to guitar games. The songs that were composed for the game GuitarBots, also found it's way to a digital music release, Stringweaver EP.